It was very slow today. Even at the farmer's market, which is adjacent to the "art in the alley" location. Kharma, the art dog, did his best to sale, but no avail. I'm hoping to get better recognition at the Oceanside Art Gallery. 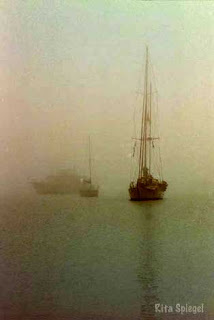 Through the Fog (right) is one of my three of my photographs will be presented. Location: 602 Mission Ave, Oceanside, CA 92054.